The story so far... Amanda Waller has gathered a rag tag group of Super Villains for her task Force X program, more commonly known as The Suicide Squad. The president of the United States has learned of Amanda Waller's group and tells her that he's shutting it down. Waller than explains the need for the program and the Squad itself, and asks for his help in finding a field team leader for the group in the form of Colonel Rick Flag. The President agrees and turns over the incarcerated Colonel Flag over to her. After a successful mission, the Squad is in need of help, and are rescued by Colonel Flag, who extracts them from the Mongolian war zone, and takes them back to Belle Reve penitentiary. Sometime later, The Squad is again dispatched, this time to the far North Pole to an underwater Russian facility, where there is said to be a "Game Changing" weapon (yes another one). Whilst on route, in their transport, Killer Croc starts suffering from motion sickness, and his transport suit helmet fills up with his own vomit. Rick Flag attempts to rescue Croc from drowning in his own waste, inadvertently throws the transport off course, hurtling them down toward the icy water. The Squad crash land, and happen to actually make it to their destination via crashing nearby. Once inside, they rescue a prisoner held captive by the guards at the facility. The prisoner by the name of Hack has the ability to communicate with computers and can digitize herself and others and teleport. Hack does so with the entire Squad to The Black Vault (where the weapon is being kept). Once they all get there, The Squad discover the vault houses a giant spherical object. Hack explains to Rick Flag that the computers in the room are telling her that the scientist studying the object often heard voices from the object, most commonly heard the word... Phantom Zone! Rick Flag realizing what they've stumbled onto, orders everybody to leave as quickly as possible. Captain Boomerang claiming to see something move inside the object gets closer to it, and is blasted away by a red fiery beam from the object. All that is left are Captain Boomerang's smoldering boots. Story - 4: Two books. Two game changing weapons. Both Kryptonian. This book is also only three issues in, but unlike Red Hood & The Outlaws, Suicide Squad hasn't really pushed forward too much. The Rebirth issue was primarily Amanda Waller recruiting Col. Rick Flag, with only a short appearance by The Squad. Issues #1 and #2 are again the same story again. Amanda Waller gathering The Squad together and sending them on a mission. Most of issue #1 is The Squad being dropped to their target in a transport, and issue #2 is them getting into the facility. The story is obviously very much decompressed, and feels like the first issue of the original Suicide Squad series being stretched out over multiple issues. The line-up for The Squad is very similar to that of the recent film released a few months earlier. The only missing members are El Diablo and Slipknot... Surprisingly these are the two members that die in the movie. However in saying that, I did not expect, long time regular of the Squad, Captain Boomerang to die... Especially in the way he did too. He always was a favorite of mine, the comedy relief, but the one guy that would stab anyone he could in the back, if it served his purpose. Rob Williams threw me for a loop. And just when I thought it was getting predictable. I don't really have much else to say, so I'll get to the main point... General Zod! Who would have thought, that a book like Suicide Squad, would feature General Zod? That's what I'm loving about rebirth. The last time we saw Zod was back in the Superman/Wonder Woman title during the New 52. So it's interesting that he would turn up here. But more importantly, how is he there? Shouldn't Superman have the Phantom Zone (sphere) in the Fortress of Solitude? I mean we saw that he had fashioned a Phantom Zone projector in the pages of Action Comics, when he used it on Doomsday. And also more importantly, how is Zod able to escape it in the fashion that he does? Questions to which answers I hope we get soon. Another more important question is, how did Rick Flag know what the Phantom Zone was? I didn't think that Superman would have made it public or at least government knowledge that such a place/device was in his possession, and how would a colonel that served in the U.S army know about it? I'm really intrigued by this, and I can't wait to see how this plays out. How are The Squad going to stop an angry power hungry Kryptonian? And what will Superman do when he finds out that they let Zod loose? The backup features a good addition, seeing as how the main story is shorter than usual, most probably for Jim Lee's sake. I like that Deadshot/Floyd Lawton was inspired by Batman to don a costume and become an assassin for hire. The Captain Boomerang back up was quite funny. I loved that he saw himself as a hero, and made up a farfetched story about him being an Australian Secret Agent. Like I said, this book has a very slow start, but we seem to be getting into the meat of things now. Really looking forward to the next chapter. Art - 5: What can I say about the art, when Jim Lee is doing the art chores? Jim Lee is a legend, and I'm honored to finally be able to review a book with his art. I've been a big fan of his since the 90s, and he still injects the same amount of magic now, as he did then. I love the action sequences in the book, be it The Squad in the transport free fall or the scene where Katana and Harley are making short work of the Russian guards in the Black Vault facility. Jim Lee makes it look really cinematic. Just so it doesn't seem like I'm a fan boy that thinks Jim Lee can do no wrong, ill point out that he may be a master at visual storytelling, but he still falls into his usual traps of making his pages look like pin ups, and the character body languages speak "I'm striking a pose", as opposed to looking natural in the scene. Another thing is that Lee still puts in way too much detail at times, especially in his costume designs. Deadshot's mask is a good example. It's essentially the same as the New 52 redesign, which was also done by Lee back when that started. The simplicity and elegance of his original mask is gone. And this new look just seems off. Even Will Smith's mask in the film looked better. But I digress. Some people actually dig the new look. So I will just say. It's not my favorite look, but it's not a deal breaker for me. I like that Harley Quinn is wearing pants instead of the booty shorts she had in the film. It's a much more modest look. I remember back when Batman: Hush came out back in the 2000s I hated the look Lee gave Killer Croc in that book. I like the more original look he's gone with here. Though we only saw Zod for one page, he looked quite menacing. Jim Lee drew Zod in the tail end of his 12 issue Superman storyline "For Tomorrow". In it, Zod was much older looking, and his armor resembled that of something from Lord of the Rings. Here Zod looks menacing, and much more traditional with his goatee and slicked back hair. Should be interesting to see what Zod looks like next issue, with the full reveal! The backup feature art by Jason Fabok in issue #1 is on par with Jim Lee's work. That's the highest compliment I can give it. He seems like a natural fit with Lee's style. The issue #2 back up featured art by Ivan Reis. And I don't need to tell you what a great artist he is. I'm glad that DC has a stable of good artists, with Jim Lee, Ivan Reis and Jason Fabok in the top 3. The Rebirth Special featured art by Phillip Tan, who had adjusted his style to match Lee's so well, it had you scratching your head t times. Hats off to you good sir. Of course I must mention the superb colors by Alex Sinclair and the respected inkers that these Super Star penciller's often collaborate with. 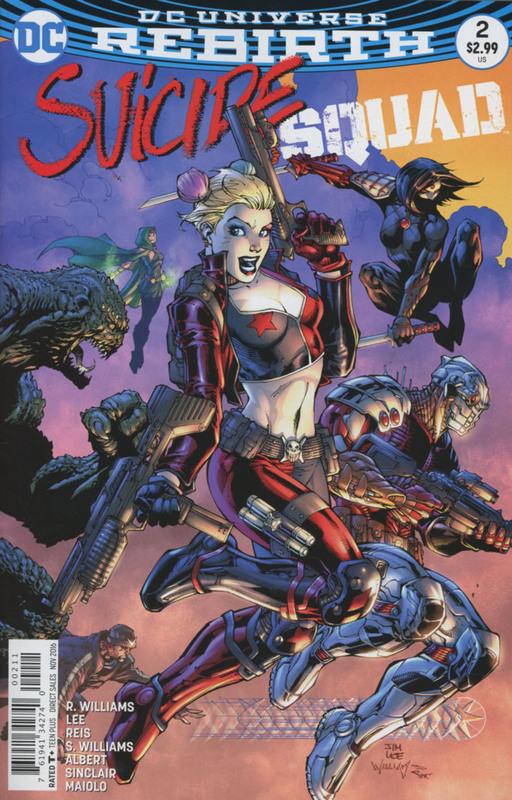 Cover Art - 5: All the covers feature Harley Quinn quite prominently. Which is understandable, seeing as how she is the most popular character from the book, as well as the DCU as a whole.